Whether it's a purchase on this website, or volunteering at your local children's hospital, you can help make a difference for children facing cancer. "The Aflac Way" says your problem is my problem. It's a spirit of caring that defines our company and our deep community commitment. As a pioneer in cancer insurance, every day Aflac helps people face serious illness with the support of flexible, insurance coverage* for their health and quality of life. Yet, too many families lack the support they need when a child receives a cancer diagnosis. So, it makes sense that the Aflac Childhood Cancer Campaign™ supports medical care as well as opportunities for child cancer patients to experience some of the joys of childhood. Net proceeds of all Aflac Childhood Cancer Campaign™ purchases on this site go to The Aflac Foundation, Inc.
*Individual supplemental coverage is offered and underwritten by American Family Life Assurance Company of Columbus. Group coverage is offered and underwritten by Continental American Insurance Company (CAIC), a wholly-owned subsidiary of Aflac Incorporated. CAIC is not licensed to solicit business in New York, Guam, Puerto Rico, or the Virgin Islands. For groups sitused in California, group coverage is underwritten by Continental American Life Insurance Company. For individual supplemental coverage in New York or coverage for groups sitused in New York, coverage is offered and underwritten by American Family Life Assurance Company of New York. Your purchase helps care for children with cancer. Research has come a long way. Today, more than 80% of childhood cancer patients survive* - although they face a long, difficult treatment process and most experience life-long consequences. That's why the Aflac Childhood Cancer Campaign™ helps provide emotional support services to help children navigate the ups and downs of treatment. Experiences play a key role in health and well-being, and we believe that all children deserve comfort during cancer treatment. Many children's hospitals take a "total patient" approach to treating children with cancer. They emphasize care of the whole person, not just the disease. * Cancer Facts & Figures 2017, American Cancer Society. Children's hospitals rely on individual donations to fund childhood cancer research, deliver cutting-edge treatment, and provide emotional support services to help children navigate the ups and downs of treatment. This is important. Studies show that the way children cope with illness influences their outcomes. Yet, these essential support services typically may not be covered by medical insurance. What's more, only four percent of National Institutes of Health (NIH) funding is directed toward childhood cancer research. Whether you make a purchase from the Duckprints store or volunteer at your local children's hospital, your gift can be part of the solution. The Aflac Foundation, Inc.'s primary mission is to support the treatment of children with cancer as well as research that may ultimately help conquer pediatric cancers. Awareness: Understanding is the first step toward action. Aflac's #Duckprints campaign reaches hundreds of thousands of people on social media and at events from Atlanta to Arizona, and South Carolina to Ohio. We also sponsor events such as CureFest, which will bring together childhood cancer advocates in Washington, D.C. to share insights and advocate for the issue. Action: Building on more than twenty years of ongoing support for The Aflac Cancer and Blood Disorders Center at Children's Healthcare of Atlanta, we help underwrite treatment for children, fund essential research, contribute to more than 50 children's hospitals nationwide, and support child-life programs to improve quality of life and help children cope with their illness. Fundraising: We help raise life-saving funds from Aflac employees, its sales force, and the public. Efforts include sales of Duckprints merchandise and an annual plush Holiday Duck available online and also at Macy's, which has raised more than $3.2 million for the childhood cancer cause since 2001. Volunteers: Every year, thousands of Aflac employees and agents lend their hearts and hands to the cause, from giving blood to running fundraisers to helping to shed light on this under-funded and often misunderstood issue. Aflac is proud to provide support to children's hospitals across the U.S. through our Duckprints and Holiday Duck programs. Your purchase supports children at over 50 hospitals in 27 states. Net proceeds from your purchase will be donated to The Aflac Foundation, Inc., which supports your nearest participating hospital. 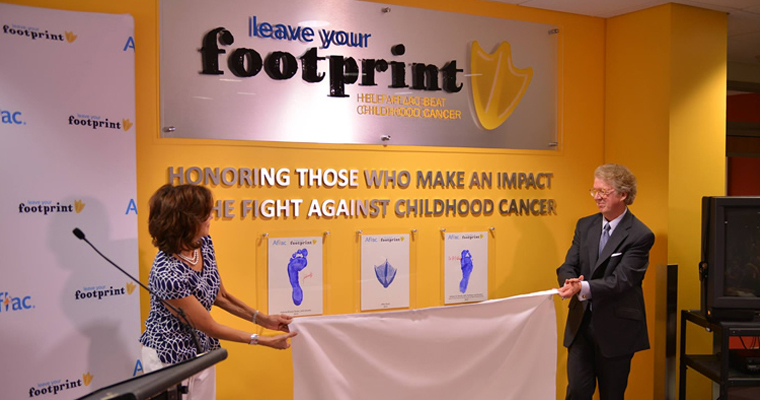 Aflac Duckprints is a national effort to raise awareness for causes like childhood cancer research, programs and treatment. It encourages everyone to get involved via social media, and honors those who are making meaningful progress against childhood cancer. Since 2013, the Aflac Duck has traveled to communities and children's cancer hospitals across the U.S., at each stop recognizing people who are making a difference for the cause. Award recipients include researchers, patients, caregivers, volunteers and others. U.S. News and World Report recently revealed their top 10 list of best pediatric cancer programs in the country, and the Aflac Cancer Center has once again made that prestigious list. Your generous support has powered research in the Aflac Cancer Center that is shared throughout the country with other pediatric cancer programs.